Want to grow what you eat and eat what you grow? Visit this lively, flourishing school-andcommunity garden and be inspired to cultivate your own. At an elementary school in Santa Fe, the bell rings for recess and kids fly out the door to check what’s happening in their garden. As the seasons turn, everyone has a part to play in making the garden flourish. From choosing and planting seeds in the spring to releasing butterflies in the summer to harvesting in the fall to protecting the beds for the winter. Even the wiggling worms have a job to do in the compost pile! On special afternoons and weekends, neighborhood folks gather to help out and savor the bounty (fresh toppings for homemade pizza, anyone?). Part celebration, part simple how-to, this close-up look at a vibrant garden and its enthusiastic gardeners is blooming with photos that will have readers ready to roll up their sleeves and dig in. Back matter includes suggestions for further reading and online resources. George Ancona is an author and photographer who has published more that one hundred books, some of them bilingual. He is known for his exquisite photography and close-up looks at a variety of cultural subjects. He lives in Santa Fe, New Mexico. The documentary-style narrative and uplifting photos put the joy of kinship, outdoor work, and growing food within reach of readers. This fun and inspiring season-by-season description of a school gardening project could encourage others to repeat this extraordinary experience. The clearly written text works seamlessly with the two kinds of color illustrations: Ancona’s many effective photos record the garden experience over the course of the growing season, while the children’s drawings (in crayon or marker) offer a fresh counterpoint to his engaging photos. An inviting introduction to school gardens. 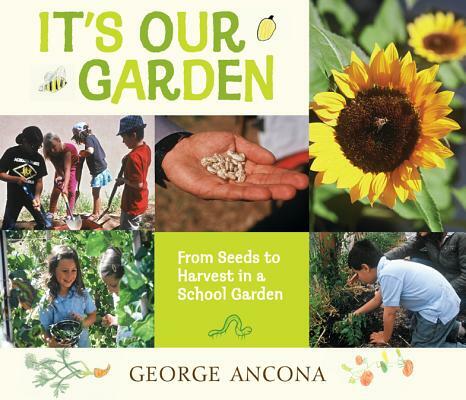 With the growing interest in school gardens, this is a timely book. Listed resources, both books and websites, give more information. The full-color photographs are well-done, and illustrations drawn by students add further interest and visual appeal. Like these children and adults working in harmony with the earth’s resources, Ancona’s words and visuals exist in a beautiful balance.